A fun idea for a football weekend stay at home tailgating party is making hot wings. While they can be a bit messy, it is a fun project for the whole family. I have been making wing for years at home and I prefer to bake them in the oven. My experience with ordering wings has been that they are often over-cooked and dry. The method I use keeps them moist tender and delicious. I have served my classic wings to rig crews and have received many compliments on how good they are. The first step is buying your wings. Usually I buy whole wings fresh and cut them myself. You also need to remove the wing tips because they will more than likely burn when cooking. You will need a heavy knife and you need to cut the wings at each joint. Once you have done so they will start to look more familiar. Another option is to buy pre-cut wings usually found in the frozen section of a super market. This saves time in cutting. 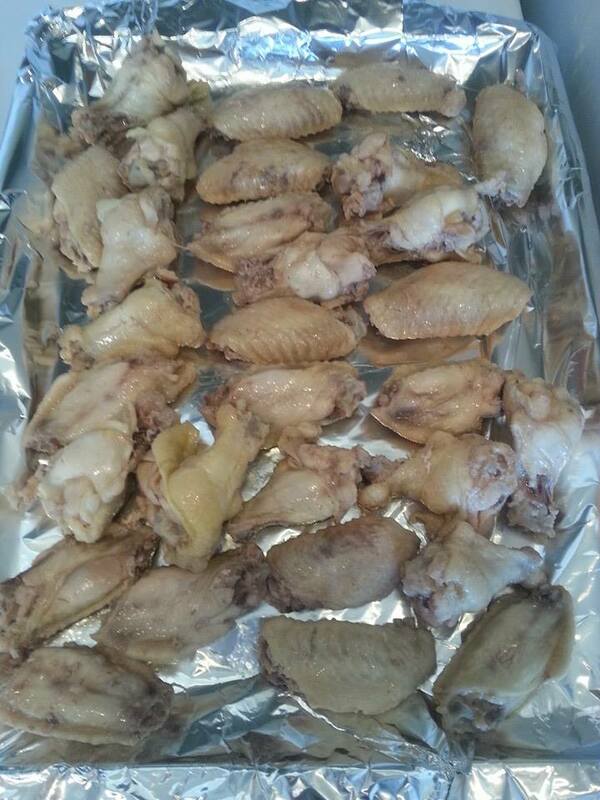 However, you will need to defrost them if you plan to brine the wings (see below). 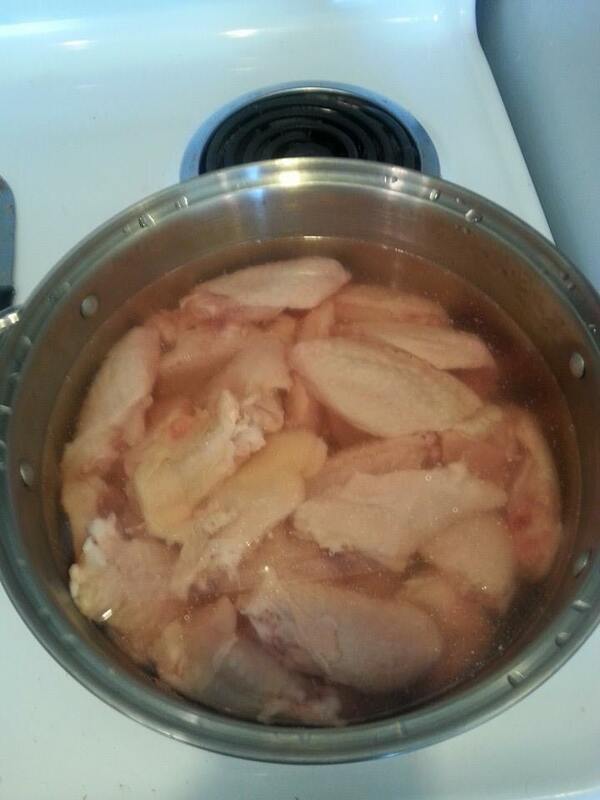 Place all the wings into a 6 quart pot and if you have time soak them in a salt brine overnight. Drain the brine and add water to cover. Bring the water to a boil and simmer for 5-10 minutes. You can add the wing tips to this and if you plan on using it for a soup stock. Next, place the wings on a baking sheet lined with foil. Place in a 450 degree oven and cook until the wings are golden brown on the top side. This takes about 15-20 minutes in my oven. Remove the wings from the oven, turn them over, and repeat. Watch them closer because they tend to cook faster the second time around. Here is where kids can get more involved. Every family member should have a sauce picked out for the wings, or if you want to keep it simple, just make one or two sauces. My two favorite ways of coating the wings are using a bowl or an old plastic gallon ice cream tub. The bowl is pretty simple. Just add the sauce and then the wings. Using a spatula carefully stir/roll the wings from the bottom to the top to cover all the wings. You may have to do it in batches. The ice cream tub is a bit easier. Just add the sauce and wings. If I have my kids helping, I secure the lid with tape and have them shake the tub in a rolling motion to coat the wings. Serve hot and enjoy. Make sure to have plenty of celery and/or carrot sticks as well as ranch or blue cheese dressing. Below are a few different ideas you can use for sauce for the wings. Take note the Old Bay and Taco Spiced wings are coated before they are baked. With all the others just toss the wings in them like the classic hot wing sauce. Classic Hot Wing Sauce: ½ cup Franks Red Hot, 1/3 cup butter or margarine. Or just buy Franks Red Hot pre-made hot wing sauce. Variations on the Classic: Add another hot sauce to the mix to bump the heat up a bit, such as Tobascco, or a few drops of your favorite harbano or ghost chili sauce. You could also add a drop of liquid smoke to give it a smoky flavor. Creamy ranch: This one is great for kids. Use 1 cup ranch dressing, 1 tablespoon parmesan cheese. To make bacon ranch add 1-2 tablespoons of real bacon bits. You can also mix the classic wing sauce and the creamy ranch. Old Bay: 2 tablespoons flour, 1 tablespoon Old Bay. Toss 2 lbs of wings to coat. Bake and toss in classic hot wing sauce. Garlic Butter: Mix 1/2 cup butter and 2 tablespoons lightly sautéed minced garlic. Soy Honey: Toss wings with 6 tablespoons melted butter, 1/4 cup honey, and 2 tablespoons soy sauce. Chipotle: Purée 3 tablespoons chopped chipotle chiles in adobo sauce, 1/4 cup each of apple cider vinegar and honey, 3 tablespoons melted butter and 1/2 teaspoon ground cumin. Teriyaki-Orange: Bring 3/4 cup orange juice and 1/4 cup teriyaki sauce to a simmer until reduced by half. This should take about 15-20 minutes. Ginger-Scallion: Add 2 tablespoons of each of grated ginger, butter, soy sauce and mirin to a sauce pan. Add 3/4 teaspoon each of sea salt and sesame oil. Heat until blended. Add 1/2 cup minced scallions. Toss with wings. Taco-Spiced: After boiling the wings, pat them dry, and toss with 3 tablespoons taco seasoning and roast. Serve with salsa. Pizza: Toss the wings with salt and 2 teaspoons dried oregano; roast 30 minutes. Divide 1/4 cup sliced pepperoni and 1/2 cup sliced onion between the 2 baking sheets; roast 15 more minutes. Toss with shredded mozzarella and serve with warm marinara sauce. Garlic Parm: Mix 1/2 cup butter, 1/2 cup Parmesan cheese, 2 teaspoons minced garlic, 1/2 teaspoon onion salt, and black pepper to taste.